The Kids Bicycle Giveaway saw more than 30 young fans go home with new bikes donated by Devil’s Bowl Speedway drivers and staff. WEST HAVEN – Jason Durgan left little doubt in his first victory of the season at the Asphalt Track at Devil’s Bowl Speedway on Saturday, July 2. The point leader of the NASCAR Whelen All-American Series Sportsman Modified division was a dominant winner in the “Firecracker 44” race on a night that also saw a large, enthusiastic crowd cheer Seth Bridge, Scott FitzGerald, Eric Messier, and Zach Wood as winners. Durgan, of Morrisonville, N.Y., waded through an early mess in the 44-lap Modified race that saw three wrecks in the first two laps. After trailing early leader Dave Snow for several laps, Durgan threw his No. 17 car to the outside lane at the one-quarter mark in the race and powered into the lead, then set sail for the rest of the distance to win by a dominant half-track advantage. Behind Durgan, Brandon, Vt., racer Snow held off a persistent challenge from Jackie Brown Jr., for much of the race. Ron Proctor tracked the pair down and passed them both on the outside lane to move into second place, but was thwarted by a slowly deflating tire in the final laps and began to drop back. Snow moved back into second place for the best finish of his career. Brown held on for third, followed by Travis Bruno and Joey Roberts. Seth Bridge of Mendon, Vt., inherited his first-ever victory following technical inspection for the Late Model division. Bridge ran a very competitive 44-lap race to cross the finish line in third place. Josh Masterson and Robert Bryant Jr., ran 1-2 originally but their cars were found to be below the minimum ride height requirement; they were each penalized five positions in the official running order for the minor infraction. Bridge was named the winner ahead of Steve Miller, Chad White, Bill Donahue, and Jesse Carris. West Rutland, Vt.’s Scott FitzGerald won an entertaining 20-lap battle in the Renegades after an exciting back-and-forth run with Matt Monaghan. The pair traded the lead multiple times per lap as time ran out, and FitzGerald was out front when the checkered flag waved. Monaghan took the runner-up spot with Tony Salerno a career-best third. Jim McKiernan and R.J. Germain rounded out the top five. Mini Stock rookie Eric Messier of Hinesburg, Vt., also picked up a win in the inspection line. Apparent first-place finisher Harold LaVair was found to have an unapproved wheel offset and was penalized 10 positions. Messier’s win was his second-straight victory. Georgia, Vt., racer Zach Wood – Messier’s teammate and a fellow rookie – was moved up to second place with Brad Bertrand, Mike Whalen Jr., and Brett Wood next. Zach Wood was the winner of a bizarre 50-lap Enduro Series race to close the evening. As holiday fireworks exploded in the air prior to the start of the Enduro event, an unexpected – and very heavy – rain storm soaked the race track. Because the Enduro Series thrives on all types of wacky situations, the race was run with cars slipping and sliding around, made only more exciting as the rain returned halfway through the race. Wood went off the track in the early going and lost a lap, but recovered to un-lap himself and eventually take the lead and the win. Cory Gray finished second and Tommy Kudlacik – who led most of the race – finished third after a scoring recheck. Brett Wood and Hunter Murray completed the top five. More than 30 bicycles were given away during the event to the delight of young fans in attendance. 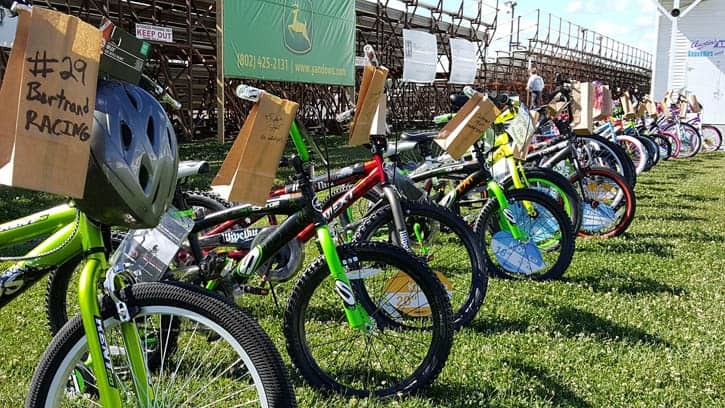 Bikes of all shapes, sizes, and colors were donated by race teams and officials, and kids that entered the contest were selected by blind draw to win. Devil’s Bowl Speedway is located on Route 22A in West Haven, Vt.